The Zodiac by Degrees provides symbols and interpretations for each of the 360 degrees of the zodiac. These symbols make a direct connection with your basic spiritual energies and penetrate the private language of your personal mythology. 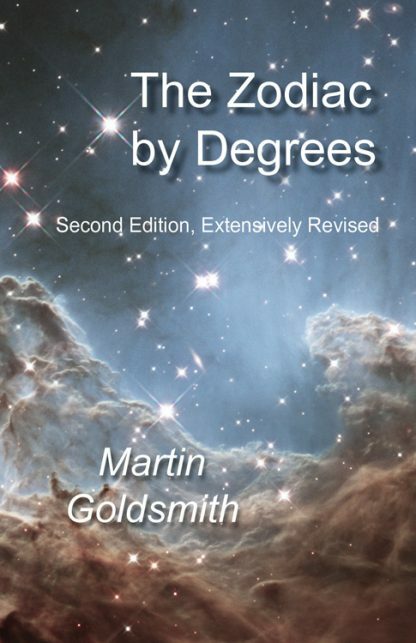 For this second edition, every one of the 360 degrees has been reexamined from extensive lists of examples. In the end, about ninety degrees have undergone major changes and all of the rest have been clarified and sharpened. The result is a symbol system of unparalleled accuracy, and an indispensable tool for both amateur and practicing astrologers. Martin Goldsmith has studied zodiacal degree symbols for more than 40 years and has done extensive research on planets, signs, and houses. He has a PhD in the history of science with an emphasis on the intersection of early modern science and the Western occult tradition. Goldsmith is the author of Moon Phases: A Symbolic Key, which provides images for the 28 phases of the moon. More recently he has published Jupiter�s Dance, which provides radical new interpretations for Jupiter and the other planets. Martin lives in New Mexico.